Since many families today are interested in cremation as their choice for final disposition, we have enhanced our cremation services to offer you more commemorative options. The funeral service, and the interment of cremated remains, can help family members begin to accept the fact that a death has occurred, and can also help initiate the healing process. Before cremation takes place, you may wish to have a funeral, visitation, memorial service, or other celebration of life services. 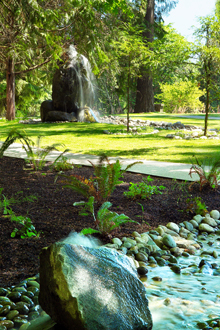 Afterward, you might arrange a final resting place at Deer Creek Cremation Garden or Rhododendron Urn Garden, which are on the grounds of Woodlawn Gardens, where loved ones may later visit. The following provides a short description of our cremation services. This option has all the elements of a full traditional funeral with viewing/visitation and a loved one present at the service. Following the service, we will cremate and follow your wishes for a final resting place. This option gives your family an opportunity to view your loved one in a traditional visitation, such as with a full traditional service. After the viewing/visitation, your loved one is cremated and then a memorial tribute (with or without an urn present) is conducted later. Family and friends have the ability to pay last respects at a viewing/visitation or, if they do not wish to participate in the viewing, they can pay last respects by attending the memorial tribute only. Many families choose this package when they do not wish to have a traditional funeral ceremony, but want time to say a final farewell in a less formal setting. The viewing/visitation is followed by cremation. Just a few family members are present. A large number of people processing to the cremation facility while a bagpiper plays. We are committed to providing the finest service to families who choose cremation. That is why we have had our own crematory facility since 1985. Your loved one is always under the care of our licensed staff. An advantage of having a local crematory is that you have the opportunity for a witnessed cremation for your loved one. 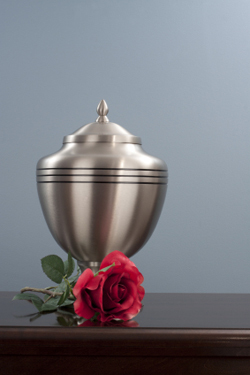 When cremation is complete, we will personally deliver the cremated remains to you, or to the burial location. At Woodlawn Cemetery we have Deer Creek Cremation Garden, Rhododendron Urn Garden, and interior glass front niches in the spacious lobby of our funeral home.